Despite the shocking tragedy of the Grenfell fire in London last summer, an online poll has revealed that 50% of tradespeople don’t feel confident in advising customers on fire door safety. Despite extensive media coverage about the dangers of inadequate fire protection in offices and homes since the disaster, less than 20% of tradespeople polled have seen an increase in demand for fire safety products or parts such as replacement intumescent strips for fire doors. The results are published in support of Fire Door Safety Week (24 September – 30 September) which aims to raise awareness of the importance of fire doors in saving lives. The poll followed a national survey of 2,000 adults across the country, carried out by online trade supplier IronmongeryDirect and supported by the Fire Industry Association. The results illustrate an alarming lack of general public awareness of the life-saving role of fire doors which are a legal requirement in all commercial, public and multi-occupancy buildings. A particularly disturbing outcome was that 70% of respondents would not know who to contact if they noticed a problem with a fire door. In addition, almost one in two people surveyed admitted that they do not know how to identify a fire door. This research highlights the need for tradespeople and the wider public to be more aware of the essential role that fire doors play in keeping them safe. Fire doors are specifically designed to withstand fire for between 30 and 240 minutes and, when used correctly, they can make a significant difference in saving lives and protecting buildings. In addition, 34% of people nationally said they would prop a fire door open to let in fresh air or give easier access, among other reasons. According to the British Woodworking Federation, the organisation behind Fire Door Safety Week, three million fire doors are installed each year. However, they remain a significant area of neglect and should be regularly checked and maintained by those responsible for the upkeep of the building. 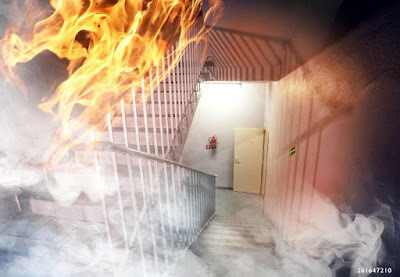 The safety campaign says that fire doors are often the first line of defence in a fire and their correct specification, maintenance and management can be the difference between life and death for building occupants. Visit www.ironmongerydirect.co.uk/fdsw for a video guide on fire door safety.